Pakistan has been the staunchest ally of the United States in the war against terror, President George W. Bush often told us, to say nothing of Vice President Cheney’s unprecidented support for the South Asian nuclear power. Yet Pakistan was never able to find in itself the courage to pick one side or the other: democracy and the United States or Islam and the Taliban. Anti-terror or terror. Because Pakistan refused for most of the Bush Administration to use its army to root out the Taliban and al-Qaeda (maybe even Osama bin Laden himself) from the tribal areas near Afganistan, the U.S. started raining down death on terror leaders iside Pakistan from predator drones armed with missiles. Countless terror leaders were killed. Pakistan was torn further internally by its number one ally and benefactor, the U.S., ignoring preas from its government to stop violating its sovereign borders — from the air. Pakistan even mustered its Air Force to the tribal areas in attempts to find and destroy the U.S. drones — with little consequence. Now Pakistan has a new Government headed by Mr. Zardari and Mr. Gilani. Musharraf is out. And India along with much of the world believes that Pakistan had some hand in the terror attack in Mumbai. “This is what hurts Pakistan. It hurts the leadership. Indeed, it hurts the government. 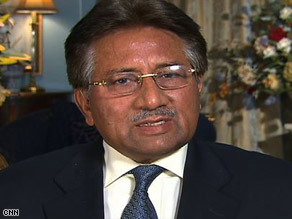 It hurts the people of Pakistan,” said Musharraf, speaking from Dallas, Texas, during a book tour in the United States. Former Pakistan President Pervez Musharraf says anti-American sentiment in Pakistan is high. “Nobody in Pakistan is comfortable with the strikes across the border. There is no doubt in that. Public opinion is very much against it,” he said. “But as far as this issue of the new president — President Obama having taken over and this continuing — but I have always been saying that policies don’t change with personalities; policies have national interest, and policies depend on an environment. “So the environment and national interest of the United States being the same, I thought policies will remain constant,” he said. Musharraf seems to be making a plea to President Obama, who has claimed a “new way” in the Middle East and with Iran, that Pakistan too deserves a new lease on life — and American wealth in the form of aid and assistance; of which Musharraf has been one of the number one beneficiaries in the past…. Can there be any doubt about who wants Israel gone? Osama bin Laden wants Israel (and George W. Bush) gone, as he said again in a tape widely released yesterday. And President Ahmadinejad wants Israel gone, as he has said many times. Today, Iran’s Ahmadinejad told Al-Manar television, owned by the Iranian-backed militant group Hezbollah, “Arabs can do many things on the political level — they can cut off all open and secret contacts” with Israel, “they can use their political capabilities to pressure the backers of the Zionist entity by severing relations with them. And they can make use of their economic wealth,” Ahmadinejad said. Ahmadinejad has also called for all nations to stop oil exports to Israel and those nations that support Israel. Across the Muslim and Arab world, huge anti-Israel protests have pressured moderate leaders not to support Israel and the United States. Iran’s president urged Arab leaders Wednesday to cut all contacts with Israel and use their political and economic influence to pressure the Israelis to halt their offensive in Gaza. Mahmoud Ahmadinejad told Al-Manar television, owned by the Iranian-backed militant group Hezbollah, that the Arabs should also pressure Israel’s Western backers to stop the fighting, which Palestinian health officials say has killed more than 1,000 people in the Gaza Strip. “Arabs can do many things on the political level — they can cut off all open and secret contacts” with Israel, “they can use their political capabilities to pressure the backers of the Zionist entity by severing relations with them. And they can make use of their economic wealth,” Ahmadinejad said. Israel says it launched the offensive Dec. 27 to stop rocket fire against southern Israeli towns by Hamas, which has controlled the Gaza Strip since 2007. Iran is Hamas’ main backer, providing political and financial support. Iran denies sending Hamas weapons. Ahmadinejad dismissed allegations that Iran is urging Hamas to reject Egyptian diplomatic efforts to end the fighting but demanded that Egypt open the border crossings with the Gaza Strip. Al-Qaida chief Osama bin Laden has issued a new audiotape urging Muslims to launch a jihad, or holy war, to stop the Israeli offensive in Gaza. The announcement comes in the wake of massive anti-Israeli protests in the world. Today is day 19 of Israel’s incursion into Gaza. Despite calls for a cease-fire from the U.N., neither side can agree to terms. In Israel, Likud Party chief Likud Party, Binyamin Netanyahu has called for and end to Hams. Iran and other anti-Israel factions have called for an end of Israel. The al-Qaeda tape was posted Wednesday on Islamic militant Web sites where al-Qaida usually issues its messages. The authenticity of the tape cannot be independently confirmed. But the voice resembles that of bin Laden in previous messages. The authenticity of the recording could not be verified immediately, but it appeared to be a typically provocative message from the al-Qaeda leader, taunting the United States as it prepares to hand the presidential baton from George W Bush to Barack Obama. The tape, entitled A Call for Jihad to Stop the Aggression against Gaza, came as the reported death toll from the 19-day Israeli offensive against Hamas rose to 971. Thirteen Israelis have been killed so far. For Israel, the fight in the Middle East has always been seen as existential. In Israel’s view, Hamas, Hezbollah, regional enemies and Iran are foes intent upon destroying the Jewish state. He has said this nation and these people should be “wiped from the map” and is developing a nuclear program. For Hamas too this is an existential fight. Hamas sees that its defeat can mean that it will no longer exist…. Gaza: Existential Battle for Hamas, Iran’s Regional Influence? Belgian police Thursday arrested a woman they called an “al-Qaeda living legend” as part of an operation to thwart a terror attack being planned to coincide with an EU summit in Brussels, a Belgian police source told CNN. Police seized 14 people, one of whom was planning to carry out a suicide attack in Belgium, the source said. They had contacts at the “highest levels of al-Qaeda,” the source said. The leaders of the European Union’s 27 member states are meeting in Brussels Thursday and Friday. It is not clear that the heads of state and government themselves were the target of the planned attack. The federal prosecutor’s office in Belgium identified one of the suspects as Malika El-Aroud, the widow of one of the men who assassinated a key opponent of the Taliban in Afghanistan two days before September 11, 2001. Above: Malika El-Aroud is the widow of one of the men who killed Afghan anti-Taliban leader Ahmad Shah Massoud. El-Aroud’s late husband was one of two men who killed Ahmed Shah Massoud, a leader of the Northern Alliance, in a suicide mission ordered by Osama Bin Laden. Belgian police aimed to prevent El-Aroud, whom the police source called an “al-Qaeda living legend,” from moving to Afghanistan to play a role in the fight against the coalition forces there, the source said. 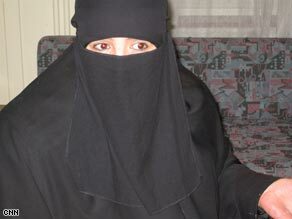 She is thought to be a recruiter for the anti-Western network, rather than a fighter, the source said. El-Aroud described the “love” she and her late husband felt for Osama bin Laden in a 2006 interview with CNN. “Most Muslims love Osama. It was he who helped the oppressed. It was he who stood up against the biggest enemy in the world, the United States. We love him for that,” she told CNN then. You are currently browsing the archives for the Osama bin Laden category.